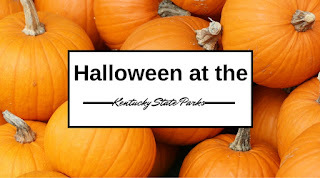 Halloween at the State Parks! It is officially Halloween week! If you are still trying to make up your mind about what to do with your little goblins you might consider the state parks! In addition to providing fun for your family, you will also get to take in the beauty of the fall colors! I was driving this weekend and I kept pointing out beautiful trees to my husband. Most of the Halloween events offered by the parks have already come and gone but here are a few that you still have time to catch! Just a word of warning several of these events aren't suited for kids under 10 years old. Cascade Cave is offering a family-friendly movie inside the cave! (The film has not been selected. Check the park later.) The price is $5 per person at the door. Make sure you bring your own chairs because seating isn't provided! Cumberland Falls is a totally different place at night! There are lots of stories supernatural events that have taken place in the area. Guides will take you on a tour of of the park that you will never forget. Not recommended for children under 10. Your adventure will begin at the visitor center near the falls area. Cost is $10 per person. Tickets will go on sale at 7 p.m. each night at the visitor center. Want to take a walk through one of the oldest and haunted cemeteries in Kentucky? Then head to Old Fort Harrod State Park! The experience starts at dark and lasts until 10 p.m. for only $5 a person. This activity is not recommended for children under 10. White Hall State Historic Site is offering an alternative to the typical haunted house. "Ghosts" will come out of the darkness to tell the incredible stories of the Clay family, but in a theatrical history lesson tour that is very family-friendly. Afterwards, guests are treated to hot apple cider and cookies. Tickets are $10 per person and are by reservation only. Tours run from 7-9:30 p.m. There is more information on the KY State Parks page. Robbery on the Rails at Kentucky Railway Museum!